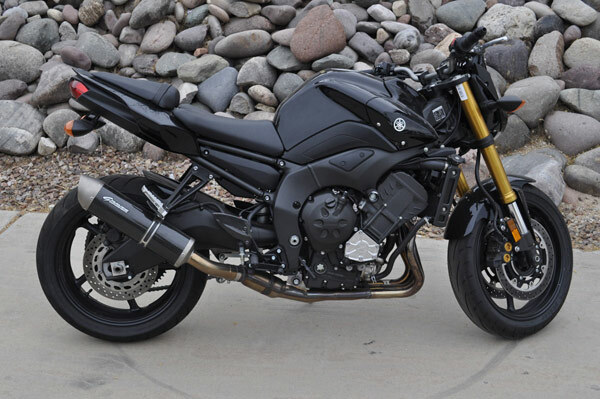 Graves Motorsports Yamaha FZ-8 Cat Back Exhaust System with carbon fiber silencer. This Graves Motorsports slip-on exhaust system for the all new 2011-2013 FZ8 sport bike is built using the same Championship design and craftsmanship found in every Graves Motorsports Exhaust. This system features mandrel bent stainless steel tubing and a carbon fiber silencer with a Titanium tapered conical outlet. Graves Motorsports' "Everlast" packing produces an exhaust note like no other, and holds up longer to the extreme conditions of a high revving motorcycle. This full exhaust system delivers exactly what the new FZ8 deserves; increased POWER, lasting durability, weight loss, IMPROVED style and sound. See attached dyno charts for more info.